Claude Mellan, Adam and Eve at the Foot of the Cross | Ca. 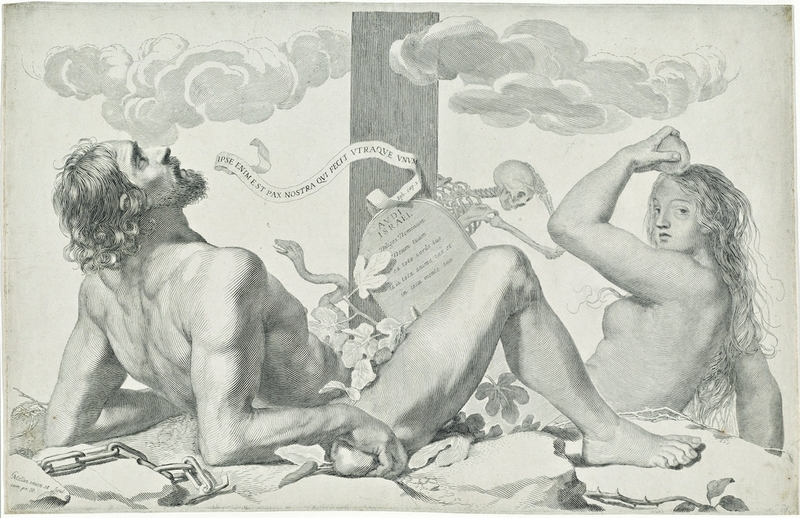 1647, Engraving on laid paper | National Gallery of Art, Washington D.C.
On first glance, the ideal of marital union is a paradox. It comprises composite parts, it remains elusive. Yet marriage, being the most intimate of friendships, depends on union. In the struggle for it we find ourselves at the heart of the mystery of love, and are asked to live a profoundly significant freedom — a freedom that has present effect and eternal consequences: a freedom bound in the perennial human question of happiness. [T]he first natural bond of human society is man and wife. Nor did God create these each by himself, and join them together as alien by birth: but He created the one out of the other, setting a sign also of the power of the union in the side, whence she was drawn, was formed. For they are joined one to another side by side, who walk together, and look together where they walk. Modern dualism separates both our existence and our loves. We think of our feelings and actions as separate from our being — our minds are perceived as independent from the body, our souls are also severed or forgotten. Love follows in this pattern, initiating a spiral of demise in this disintegration — itself a desecration of the goodness of the whole order of goodness. We consider ourselves incapable of belief and commitment. We doubt or refuse entirely the reality of eternal consequences. We act as though what we do has only temporal import. The ideal of marital union naturally dissolves from here, for it is dependent on the right ordering of our own love and desire, if it is to embrace that of another human being into the ordering of charity. We must redirect the ordering of our loves and desires to be in accord with the incarnational ordering itself — oriented to the goodness and the unity of our very being, our body and soul — and so become the image of God we are made in. Every marriage is born in an act of trust in the possibility of union: trust in the bond of matrimony itself; trust in the work of grace that is offered sacramentally; trust in another’s love. This trust enables us to commend ourselves to a spouse in an unreserved way, emotionally, physically and spiritually. It is here that union is forged from the fragments of our lives. Like gold tested in fire, it is purified. And like every precious metal it burns to be fused. The choice to be faithful to this work of purification is an act of hope, grounded in our will: a choice that entails great risk because so much is at stake. Each marriage is tried on the level of union. Whether through past personal histories or present infidelities, whether through illness or job loss, whether through childlessness or the challenges of raising large families, there is near assurance that real marital love will entail suffering. Fundamentally, marriage allows for this suffering to be shared, and it is this vulnerability that must be rooted in the bond of trust. If we trust another enough to marry them, then we must remain confident in that original trust as trials and weaknesses are shared. Only in this way does trust becomes the anchor for love; a sustaining force that grounds the heart even when love is tested or frail. The Christian vision of marital union proceeds from the Trinitarian communion of Persons: Father, Son, and Holy Spirit, each distinct, with a different role, and yet united as one, living in perfect union — a fully shared life and love — as God. This Trinitarian manifestation of union is a model for us since it it takes human form in the Incarnation. It co-involves human flesh, elevated in Jesus Christ who is true God and true man – human flesh that is redeemed in His passion, death and resurrection. God sent His Son into the world knowing all its infidelity, its faithlessness, its division. Christ knew He would suffer and die; He knew the full force of the betrayals that would come. God did not hold back in the Incarnation, because he desired to restore communion with His creation. Our first source of union, our ascension into divine life, depends on the Incarnational reality of Christ’s life. Through His redemptive sacrifice, we believe that the Christian vision of union is possible in the disparate and inchoate circumstances that characterize human relationships: those among friends, those that constitute a marriage, and those that then grow and form families and communities. Each of these together forms what we call the one body of the Church: the Spouse whom Christ loves and upholds as the Divine Bridegroom. And in each of these instances we learn a bit of the union we are made to finally reach. In the Church, through the Church, we learn the union we are made for: the union of beatitude, the end of conflicting loves. It is no surprise, then, that marriage holds the privileged place of a sacrament. The roots of its sacred nature are nourished in the life of grace, that life which fuses what is severed and restores its bond to the heart of God. If grace makes us like God, then marriage, in its sacramentality, is intended to transmit that union, so that no longer one person, but two, receive together from the font of life the very imprint of the love which knows no partiality (cf. Romans 2.11) — a love that is undivided, whole, and forever true — and only through it can truly become one flesh. The question, then, is how such a union is possible for us, how we might enter into God’s great desire for communion with Him in order to restore union among ourselves. There has to be a way whereby we transcend the brokenness of human nature to reach these new heights of union. As we look at our lives, we see disunity everywhere. Broken families, frail marriages, divisions in friendship, and the myriad social tensions we see in the world indicate that union cannot remain grounded simply in human experience, human desire, human effort. It must aspire higher to be real. To be possible, it must ascend. We are given to understand that the relationship between a man and wife is analogous to that of Christ and his Church. What we have here is not just a beautiful image. It is the very starting point in the struggle for union. This, then, is a model we can look up to for a way forward, and in spite of the difficulty it entails. This, is the spark that will fuse disparate loves into a purified love we call union, even when reconciliation is mired in rebellion, or discontent, or betrayal. Despite our infidelity in sin, Christ remains the faithful Bridegroom. Marriage is the fertile ground, then, for the seed of His undivided love, planted in the human heart. It sprouts and grows into the capacity to mirror God’s goodness and live in communion with Him. The model for this imitation is the great sacrifice of the Cross: that radical act of Christ’s fidelity that merited our redemption and won us communion with Him once again. It is at the side of the cross that marital union grows. It is at the side of the Cross that the Church receives her life from the very heart of God. It is at the side of the Cross that the door of paradise is thrust open for us. It is at the side of the Cross that all the divided loves of the world are brought together in one offering of grace and salvation. It is at the side of the Cross that we cleave to him in our sinfulness and frailty, we are bound in his blood — we are saved from the misery of imperfect love, and hear that godly prayer for union once more: Holy Father keep them in thy name…that they may be one, even as we are one’ (John 17.11). The mystery of love requires nothing less than this ascent, and marital union depends on the climb. If the earthly is to attain divinity, it must go through the crucible of compassion — it must ascend to the heights of glory in the agony of pain. Only so, will it finally attain communion with God.